While browsing the Trade Literature Collection, you never know what you might find. One search might lead you to discover something you never realized was even there. Recently, I was searching for catalogs related to food or ones that included recipes. That led me to this 1917 almanac from J. R. Watkins Medical Co. 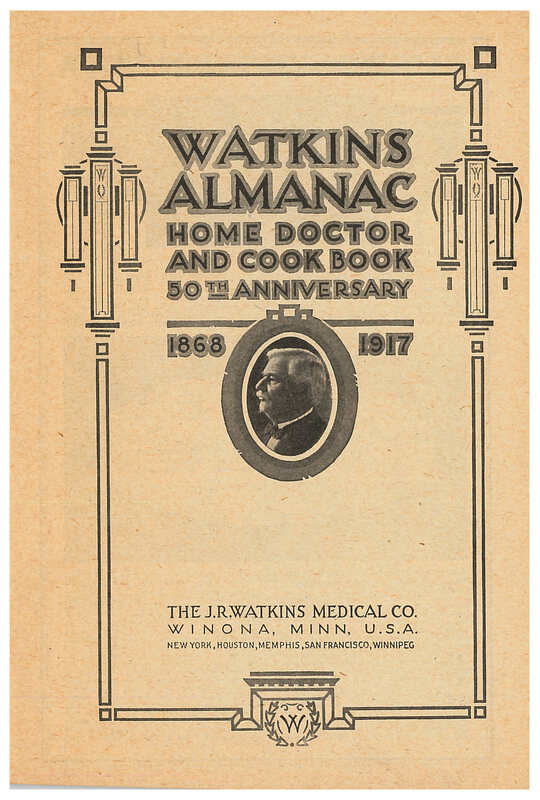 The almanac is titled Watkins Almanac Home Doctor and Cookbook, and it is their 50th anniversary issue. The front cover shows two ladies sitting on a porch. In the distance, a man is arriving with suitcases. A horse and carriage is parked behind him. The caption reads, “Waiting for the Watkins man.” The man shown in the distance is most likely a Watkins salesman. J. R. Watkins Medical Co., Winona, MN. 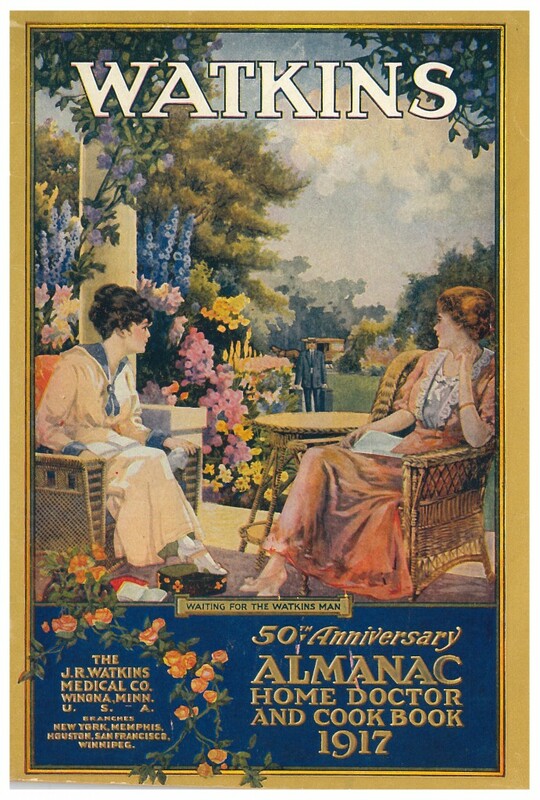 Watkins Almanac Home Doctor and Cookbook, 1917, front cover, two ladies sitting on a porch waiting for the Watkins salesman to arrive. Included in this almanac is a brief company history. Mr. J. R. Watkins founded the company in 1868 with just one product, Watkins Vegetable Anodyne Liniment. In the beginning, he tried various methods of marketing “but none measured up to the standards of service and efficiency desired by him except that of taking his goods personally to people who had use for them and asking that a bottle be kept and given a trial.” The ideal was not to ask for any payment until the customer was completely satisfied. J. R. Watkins Medical Co., Winona, MN. Watkins Almanac Home Doctor and Cookbook, 1917, title page. 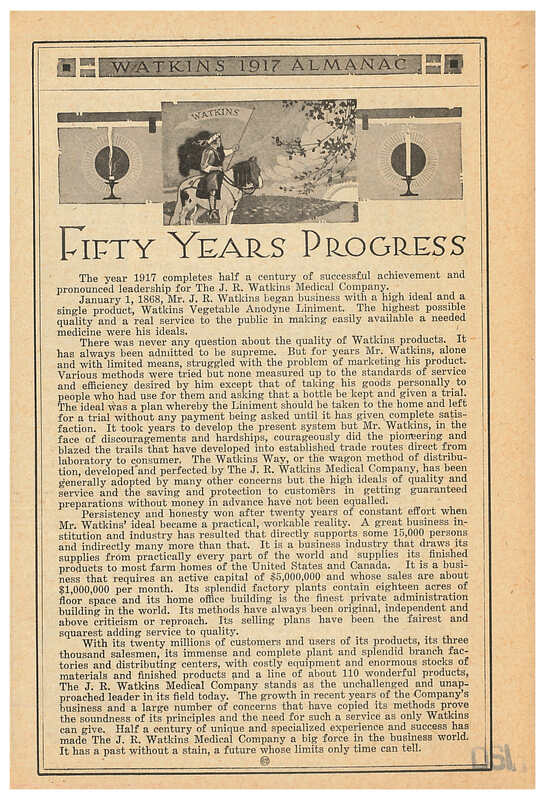 By 1917, at the time this almanac was printed, the J. R. Watkins Medical Co. had three thousand salesmen who sold their line of about 110 products door to door in the United States and Canada. The almanac includes descriptions of some of their products including soap, shampoo, perfume, toothpaste, and facial creams. J. R. Watkins Medical Co., Winona, MN. Watkins Almanac Home Doctor and Cookbook, 1917, page 62, company history “Fifty Years Progress.” Click to enlarge. As I mentioned earlier, I came across Watkins Almanac Home Doctor and Cookbook while searching for catalogs related to food. And, as the title suggests, it does include recipes. It has recipes for meat, bread, vegetables, poultry, salads, sandwiches, desserts, and preserves. There are also pages describing the spices and flavoring extracts sold by the company. One of the recipe pages is shown below. It includes a variety of frozen desserts like maple mousse, angel parfait, and strawberry sherbet. J. R. Watkins Medical Co., Winona, MN. 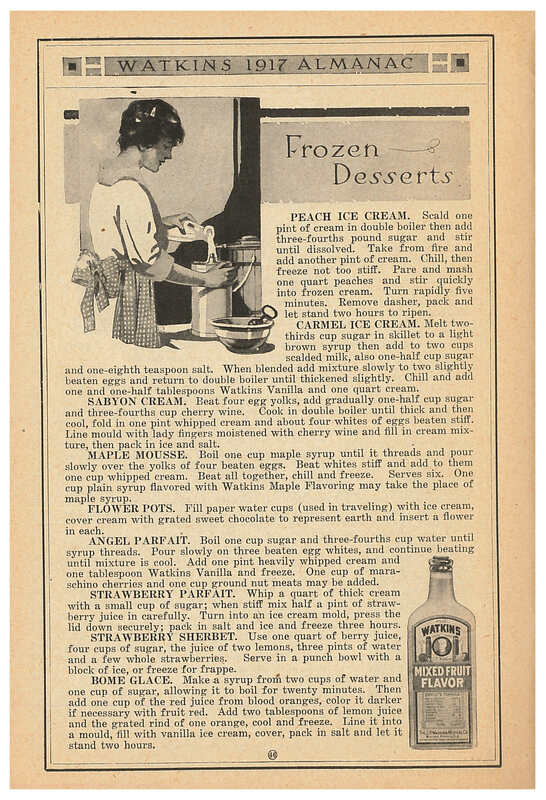 Watkins Almanac Home Doctor and Cookbook, 1917, page 46, recipes for frozen desserts. Click to enlarge. Besides recipes, the 1917 Watkins Almanac Home Doctor and Cookbook includes astronomical calculations, weather predictions, and home medical remedies. This almanac and other J. R. Watkins Medical Co. trade catalogs are located in the Trade Literature Collection at the National Museum of American History Library. J. R. Watkins Medical Co.